Biotechnology, renewable energy, nanotechnology, modern pharmaceuticals, environmental concerns, and forensics are in the news on a daily basis. Chemistry is a critical component in each of these areas and plays a central role in the nation’s health, nutrition, security, energy, technology development, and economy. The School of Chemistry and Biochemistry offers programs that prepare students for a wide range of exciting careers in industry, government agencies, patent law, and teaching. They also provide an excellent background for admission to graduate schools, including medical, pharmacy, and law programs. The chemistry bachelor’s degree program, in the School of Chemistry and Biochemistry, is certified by the American Chemical Society (ACS). Based on a core curriculum covering analytical, biological, inorganic, organic, and physical chemistry, the program provides a strong theoretical background and practical laboratory experiences using sophisticated instruments. ACS-approved tracks allow students to focus their degree program in areas such as materials, business, biochemistry, and polymers. Students in the School of Chemistry and Biochemistry enjoy exceptional opportunities to participate in cutting-edge, world-renowned research programs. 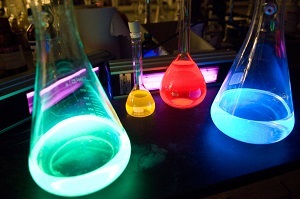 Close interactions between undergraduates and faculty create a unique learning environment, combining the foundations of chemistry with the excitement of discovery in a creative and team-oriented environment. Students make use of state-of-the-art laboratories and specialty equipment. Undergraduates often appear as co-authors on papers published in scholarly journals and present their work at scientific conferences. Students may also elect to complete the Institute’s Research Thesis Option. The school provides a nurturing environment for its majors with special sections of GT 1000: Freshman Seminar and a student-affiliated chapter of ACS. Majors also participate in the Alpha Chi Sigma professional fraternity, the Georgia Tech chapter of the National Organization of Black Chemists and Chemical Engineers, and the Women in Chemistry Committee. The school maintains a dynamic advising program with close contact between the student and academic advisor throughout the undergraduate years. For more information, please see www.chemistry.gatech.edu, or contact the School’s Director of Advising, Dr. Kimberly Schurmeier (kimberly.schurmeier@chemistry.gatech.edu).